Don’t forget the Boat Trip!! As if that is going to happen!! 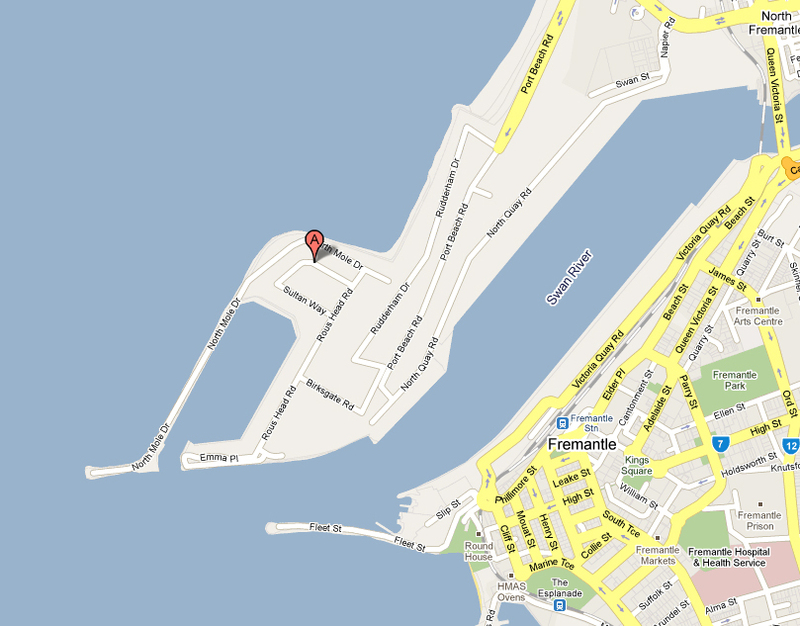 Just so you all know where you have to go to get on the boat, here is a map of the street it is on. True North will depart from North Port Boat Lifters at 1100 hrs. Guests should plan to arrive in plenty of time say by 1030 hrs. Sultan Way North Fremantle: Take the first right past Port Beach on the Coast Rd at Rudderham Drive, turn right into North Mole Drive and then left into Rous Head Rd. Sultan Way and North Port Boat Lifters is the second Road on the right. Paul from Fitzgeralds has told me he has some great specials on all his printing and mounting services so it will be great to have him on board to add some value. I also want to thank Mark Stothard and his staff for allowing us to get on what will be the benchmark for photographic workshops in Australia. You all know Markie through his blog but make sure you get to say hello to him on the day as he is probably the most motivated person I have ever met. Let some of that rub off on to you and the world will be your oyster. Ben is a guy who puts serve into service! He is here on this planet only to serve us hungry photographers. I have known Ben for almost 20 years, half my life you could say, and he has been nothing but helpful and generous with his time. Make sure you have a chat with Ben during the cruise and discuss your needs, his knowledge of photography and all its processes is second to none. And do you know what, with all that talent, he is a bloody good bloke too! What Boat Trip? Oh yeh I remember now, Cant wait. Must say thanks to you you and Mark. Its gonna be a great day, See you all there. Have a ball crew, would be nice to meet some peeps, but atm the world is my oyster! See you dockside Skipper and Gilligan . Should be a good day, looking forward to it. Be great to meet all the fellow bloggers!! Looking forward to catching up with everyone, see you all there! Thanks Christian for a Great Australia day aboard True North. The speakers were great, the company excelent and the venue well, there is no equal.